“Potential” is one of my favorite words. I put in on a vanity plate for my car years ago, and while I was at first frustrated that NY license plates only allow seven characters – which made my plate read POTNTIAL – I quickly recognized the happy irony. The word on my license plate had the potential to become a recognizable word if one more letter were added. I love the word “hope,” too, but confess to being a bit impatient with how most people use it. It so often is voiced when expressing desire for luck, or an easy way out. It is a positive word, and certainly an optimistic word, but it is too passive for me. Letter for letter, give me “potential” any day. Make your own luck. Work for your own optimism. “Potential” is “hope” with a work ethic. That makes me sound like a parent, which I am. It also makes me sound like a gardener, because working your way towards a harvest takes effort, and not trust. The Yankee in me likes that. 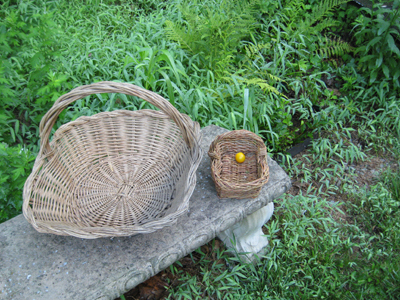 Early in the Season: Two baskets, illustrating hope and potential.